Cyanotype can be delicate, at least cyanotypes printed on rag paper. Arches Platine is a wonderful paper — shockingly strong. But any paper that spends over a half hour being washed in a water bath is having a grueling experience. Sometimes, it shows. The photo sensitive coating is intended to soak into the paper fibers. How deep it soaks depends on how good one becomes at perfecting the technique of having just enough coating to deeply soak in, but not so much that the chemicals start pooling on top of the paper, which creates a uneven texture and can affect how the exposed image processes. Sometimes, flecks of paper are worn off by the water process leaving behind white marks. Sometimes the paper dries unevenly leaving a stain. 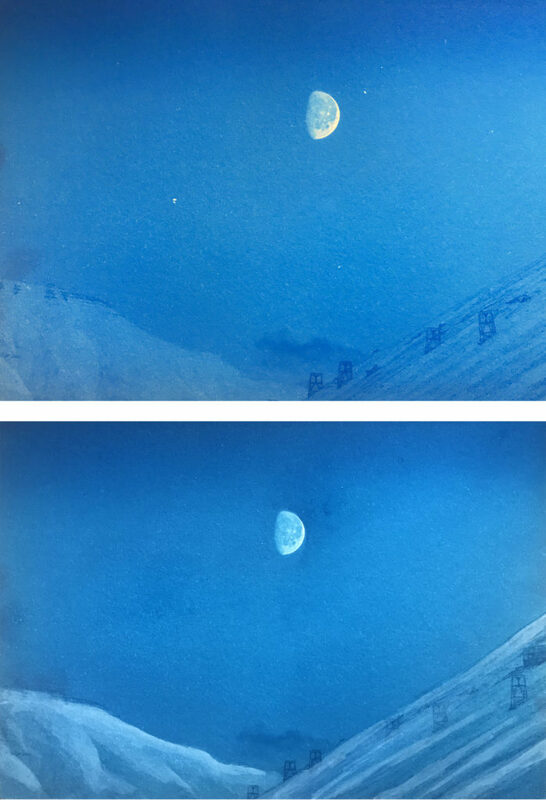 It’s possible to delicately retouch cyanotype with prussian blue watercolor. It’s possible to lighten, highlight, and just paint over cyanotype with gouache or acrylic or watercolor paints. I haven’t done a lot of cyanotype retouching, but I have done a lot of painting which gives me maybe unwarranted confidence. I brought with me several small cyanotypes, mounted and treated just like their bigger brothers to run tests on. The top image has white flecks from paper wash damage. The bottom image has been retouched. I also wanted to see what would happen if I lightened up the mountains a touch. The results aren’t perfect, but I feel that they’re less distracting from the image’s effect than the original damage. What I did was wet down the entire surface to reduce dry staining. This is tricky because the paper surface is already pretty delicate, and running a brush over it I could see that the fibers were being stressed. Having a soft brush is really important. Then I did washes of prussian blue to take down that what spotting and make it less noticeable. When I was done, I treated the mountains in a similar fashion, but this time painted in white watercolor washes to lighten up the mountains a little. I quite like the effect of the paint on the cyanotype. I want it to look painted, and I like the way it gives the image a bit of dimension. Tomorrow I’ll go through the images one by one to see which ones need retouching and which ones don’t. Then I’ll listen to loud music and start working.